Minimums as low as 1,250 for full colour CMYK sleeves! Whether you are just starting out or want to run a special marketing campaign, take advantage of our very low minimum run lengths. From 1,250 to 10,000 to over 100,000 we offer the right solution. 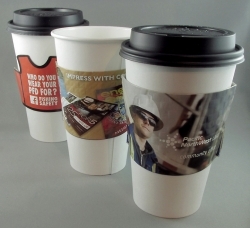 We want all coffee houses, businesses and organizers to have their own custom branded cup sleeves. We also believe sleeves should make use of multiple colours and catchy graphics enabling you to build your brand. We are the only company that produces short run sleeves at such an affordable price. In addition we offer some of the fastest turnaround times in the industry! If you require special quantities then please contact us to see how we can best help you. Want to mix it up? Split your order between multiple sleeve designs. Keep your customers intrigued with variety. We offer you the option of splitting your quantity of sleeves between multiple sleeves designs. Ask us about keeping things interesting!